Free Agent CBs: Will the Cowboys Re-sign Carr or Claiborne? Before Tony Romo and Tyrone Crawford, Brandon Carr had the worst contract on the Cowboys roster for several seasons. He is now a free agent though, and joining him is the much-maligned Morris Claiborne. For all the complaints you could have about them, Carr and Claiborne were the Cowboys top two cornerbacks in 2016. Carr was the most reliable and Claiborne, when healthy, was their strongest performer. Both leaving Dallas would create a major hole for the Cowboys defense. Now, using that number as our foundation, let's look at how much the Cowboys' cornerbacks are scheduled to cost against the 2017 salary cap. It was a tough year for the veteran, missing four games with injury and playing hurt through most of the season. After missing all of 2015 with a major knee injury, Scandrick's status in the Dallas defense has taken a big hit. Thankfully, Orlando's cap hit isn't too bad. If he can get healthy and close to his previous form next year, $5 million is a reasonable price for a top three cornerback. Scandrick was recently one of the league's best slot cornerbacks and Dallas hopes he can get there again. While Dak Prescott and Ezekiel Elliott get most of the glory, Anthony Brown is a big reason that the Cowboys' 2016 draft class is being talked about as an all-time great. Taken in the sixth round, Brown had to play a lot with injuries to Morris Claiborne and Orlando Scandrick. He also had to play both outside and in the slot, performing well in both roles. Brown's solid play as a rookie and seemingly large potential gives Dallas some bargaining power this year. They can afford to get tough with free agents Claiborne and Brandon Carr, knowing they have Brown as a capable starter. Dallas added McFadden to their practice squad in October and he was playing in a game a week later. Getting a roster spot thanks to Morris Claiborne's injury, McFadden was active for nine games in a reserve role. A third-round pick in 2013, Leon hopes he did enough to keep the Cowboys interest. An undrafted free agent who started with Dallas last May, McKinnon was injured during the preseason and eventually waived. Tennessee signed him to their practice squad in November, but once the season was over McKinnon ended up re-joining the Cowboys with a two-year deal. After bouncing between four different teams from 2014 -2015, Seamster landed on the Cowboys practice squad for all of last year. He was signed to a futures contract in January. Brandon Carr - We will be going deep into the possibility of Carr returning in a minute. Here's a quick overview; Carr turns 31 in May and has never missed a game in nine NFL season, starting every single one of them. He had a solid season in 2016 and is one of the league's best citizens and leaders. Morris Claiborne - On the other side of the spectrum from Carr in many ways, Claiborne can be a good-to-great starter for any team but cannot stay healthy. He is still just 27, though, and will entice plenty of teams in a thin free agent cornerback market. We will next discuss if Dallas can afford to keep him, and if they should even want to. 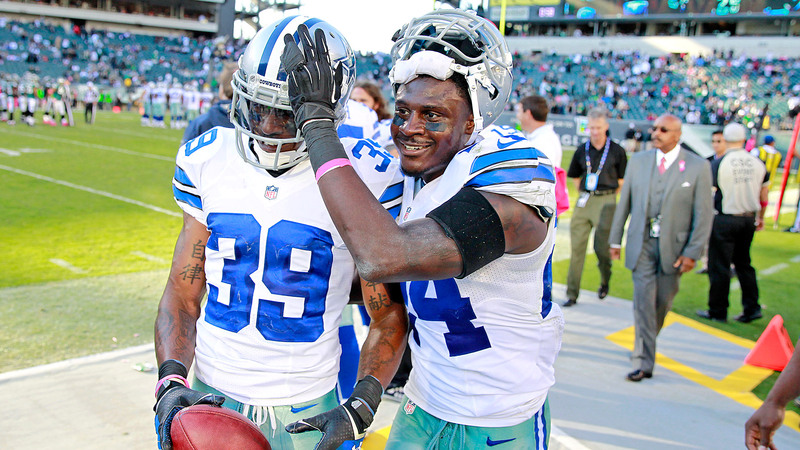 It's unlikely that Dallas would want to bring back both Brandon Carr and Morris Claiborne. The Cowboys will likely expect for Anthony Browns to move into a full-time starting role and for Orlando Scandrick to remain the slot corner, leaving one spot left in the top three. Claiborne's probably will get too expensive for the Cowboys. Despite all his red flags, he's still a former sixth-overall pick and only just turned 27 in February. Morris showed his talent early in the year and other teams certainly were watching. Dallas doesn't have the money to compete in a bidding war, so the only way Claiborne comes back is if he sits unsigned long enough to accept a bargain deal from the Cowboys. Far more likely is that Dallas will re-sign Brandon Carr to a short-term deal. As Jerry Jones said recently, availability is perhaps the most important trait of any player. Carr has that like few cornerbacks in NFL history can claim. Keeping Carr would probably give the Cowboys their best value for their money. Retaining talent is usually cheaper than replacing it. Of course, we never know if Dallas has their eye on someone specific in the upcoming free agent market. It's worth noting that the last we heard from Brandon Carr was that he was contemplating retirement, which he said shortly after the Cowboys' playoff loss to the Green Bay Packers. Whether or not that's still his stance, or if it was just said in a moment of disappointment and frustration, has yet to be determined. Thanks to Anthony Brown moving into a starting role on a cheap rookie contract, Dallas won't have to be too worried about the overall payroll at cornerback no matter what they do next. Unfortunately, their overall cap space limits being able to make a big signing in the free agent market. Still, if Brown keeps developing and Orlando Scandrick gets healthy again, maybe all you need is a reliable guy like Brandon Carr to fill out your primary CB slots. It wouldn't be a dynamic group but it wouldn't be any worse than what got you to 13-3 and a few plays away from the NFC Championship Game.